The Fururing Raceway in Furulund, Schweden held their Easter Race this past weekend in 1/8th nitro and electric classes. 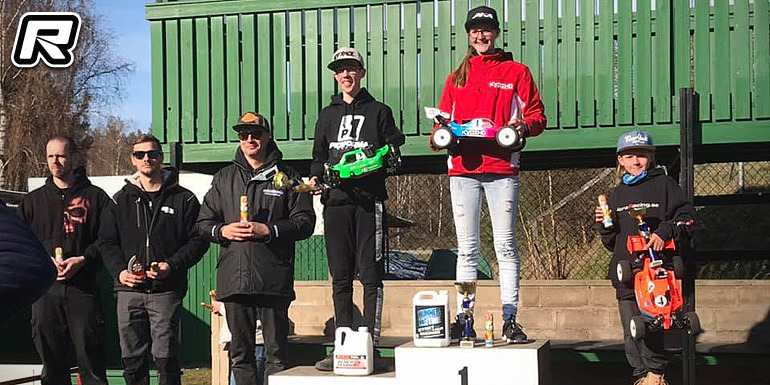 Kyosho’s Jessica Palsson was in control of things in the nitro class, taking the overall TQ after a clean sweep and also bringing home the win in the 45-minute main final with a 2-lap margin on HB Racing’s Hampus Berg. Young Ludwig Albertz (Kyosho) came in 3rd to round out the podium some four laps down. The post Jessica Palsson sweeps Fururing Easter Race appeared first on Red RC – RC Car News.